The Millennium Brick Project began with the rehabilitation and development of the First Congregational Church of Lemon Grove in 1997 and its adaptive reuse at the Parsonage Museum. One hundred years earlier the Rev. Isaac Atherton, the first pastor of the Congregational Church, gave $100 to start a construction fund for a new church. To honor Rev. 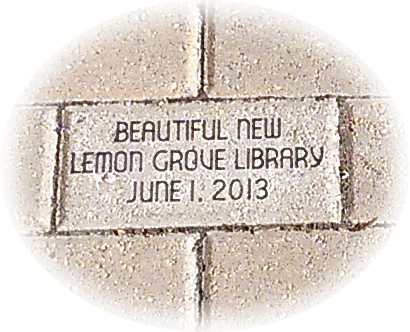 Atherton’s commitment to the young community and to fund the rehabilitation and upkeep of the museum, the Lemon Grove Historical Society created the Millennium Brick Project in 1997. The project allows people, businesses and organizations to purchase one or more for installation on Angels’ Walk in Civic Center Park between our two historic sites. Virtually every living pioneer family participates in the project. Their names are memorialized in brick for future generations. The cost to participate is only slightly more than Rev. Atherton’s first contribution of $100. Today, an engraved eight-inch brick costs $115. An engraved eight-inch square brick costs $215. We’ll glad to assist you with wording. To obtain a Millennium Brick order form, call 619-460-4353, or download the form.